Before using any of the SkyrocketWP services, you are required to read, understand and agree to these terms. You may only create an account after reading and accepting these terms. We make various services available on this site including, but not limited to, WordPress maintenance and support, and other like services. You are responsible for providing, at your own expense, all equipment necessary to use the services, including a computer, modem, and Internet access (including payment of all fees associated with such access). You agree that you will pay for the Services, and that SkyrocketWP may charge your payment method for any services purchased and for any additional amounts (including any taxes and late fees, as applicable) that may be accrued by or in connection with your account. YOU ARE RESPONSIBLE FOR THE TIMELY PAYMENT OF ALL FEES AND FOR PROVIDING SKYROCKETWP WITH A VALID PAYMENT METHOD FOR PAYMENT OF ALL FEES. 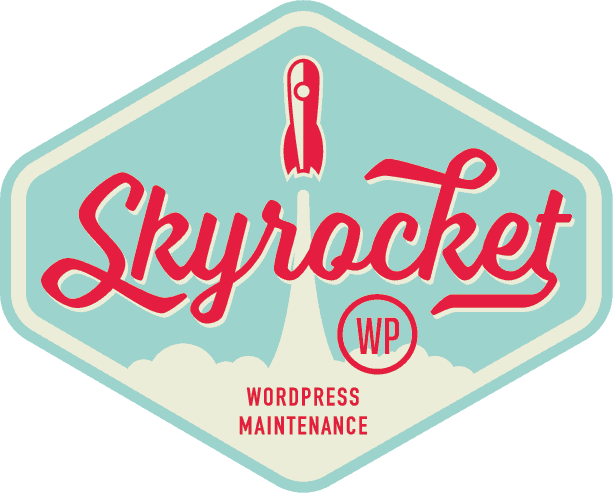 Prices for the Services may change at any time at SkyrocketWP’s sole and exclusive discretion. The Services do not provide price protection or refunds in the event of a price reduction or promotional offering. You are responsible for maintaining the confidentiality of your password and are solely responsible for all activities resulting from the use of your password and conducted through your SkyrocketWP account. Services are available only to individuals who are at least 18 years old. The term “unlimited” is subject to a reasonable use clause. The definition of reasonable use is determined by SkyrocketWP management, at its sole and exclusive discretion. Customers deemed to be abusing the SkyrocketWP service will be contacted by the SkyrocketWP management. SkyrocketWP management retains the sole and absolute discretion to suspend service to you if we deem necessary. Copyright © 05-01-2017 SkyrocketWP All Rights Reserved. Neither we or our Associates warrant or represent that your use of materials displayed on, or obtained through, this site will not infringe the rights of third parties. See “Users Materials” below for a description of the procedures to be followed in the event that any party believes that content posted on this site infringes on any patent, trademark, trade secret, copyright, right of publicity, or other proprietary right of any party. FAILURE TO TENDER TIMELY PAYMENT OF ALL FEES AND/OR FAILURE TO PROVIDE SKYROCKETWP WITH A VALID PAYMENT METHOD FOR PAYMENT OF ALL FEES MAY RESULT IN THE TERMINATION OR SUSPENSION OF YOUR ACCESS TO ALL OR PART OF THE SITE, WITH OR WITHOUT NOTICE, AND IN OUR SOLE DISCRETION. This site (excluding any linked sites) is controlled by us from our offices within Texas, United States of America. It can be accessed from all 50 states, as well as from other countries around the world. As each of these places has laws that may differ from those of Texas, by accessing this site both of us agree that the statutes and laws of the State of Texas, without regard to the conflicts of laws principles thereof and the United Nations Convention on the International Sales of Goods, will apply to all matters relating to the use of this site and the purchase of products and services available through this site. Each of us agrees and hereby submits to the exclusive personal jurisdiction and venue of any court of competent jurisdiction within Smith County, Texas with respect to such matters. All notices to a party shall be in writing and shall be made either via email or conventional mail. Notices to us must be sent to the attention of Customer Service at info@SkyrocketWP.com, if by email, or at SkyrocketWP, P.O. Box 131763, Tyler, Texas 75713, United States, if by conventional mail. Notices to you may be sent to the address supplied by you as part of your Registration Data. In addition, we may broadcast notices or messages through the site to inform you of changes to the site or other matters of importance, and such broadcasts shall constitute notice to you at the time of sending. If you have questions regarding the nature of your support request please contact us at info@SkyrocketWP.com for clarification.